Twelve Boar - Southern-fried, booty shakin' bandits of metal. 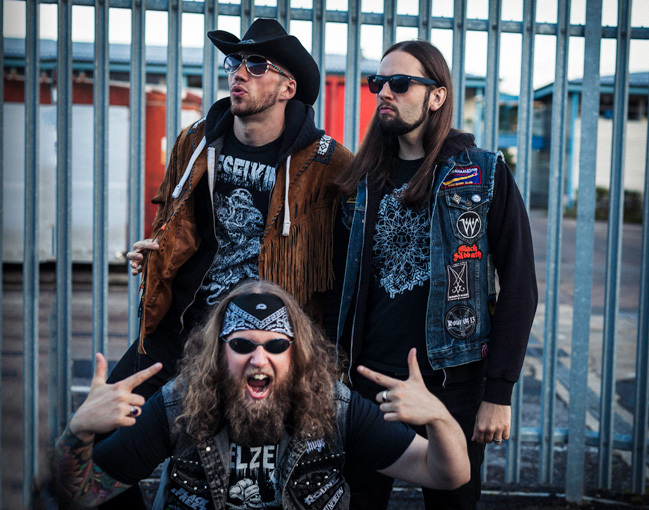 Step on up for the return of UK metal n' rollers, Twelve Boar. Proving that there's no rest for the wicked, Twelve Boar have just revealed details of their third full-length 'No Forgiveness'. Choosing to work once again with renowned producer Chris Fielding at Skyhammer Studio (home of UK doom legends Conan); 'No Forgiveness' follows hot on the heels of last year's critically acclaimed 'Beyond The Valley of The Triclops' and 2015's equally praised 'Pitworthy'. Having started out under the name XII Boar, the guys have now brushed aside their love of Roman numerals and re-branded, giving everything a brand spanking new lick of paint. Featuring killer artwork by the supremely talented Rahadil Hermana you can expect brash, Motörhead-esque riffage, huge sing-along choruses and an overwhelming sense of fun injected into every song. 'No Forgiveness' promises to showcase Twelve Boar at the top of their game and will undoubtedly be a strong contender for the best of 2017. 'No Forgiveness' is due for release on Friday 8th September 2017.